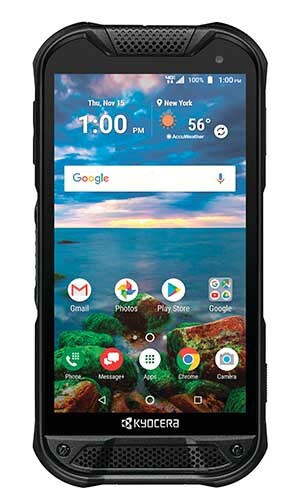 SAN DIEGO – November 15, 2018 -- Kyocera International Inc., the leader in rugged mobile solutions, today launched the rugged DuraForce PRO 2, a 4G LTE Android smartphone now available through Verizon Wireless. Designed for business and enterprise use, especially construction, public safety and transportation as well as adventure-seeking consumers, DuraForce PRO 2 is dependable and durable in harsh environments on the job or in everyday life. “DuraForce PRO 2 is our fifth in the Dura line of rugged military-grade smartphones,” said Akira Iino, Vice President at Kyocera International’s Communications Equipment Group. “With a decade of experience developing industry-leading rugged devices, we’ve been able to incorporate cutting-edge technology and features ideal for both enterprise customers and weekend adventurers. This device can stand up to harsh environments like construction sites or search and rescue missions and action sports like kayaking and mountain biking.”Noisy environments are no match for the phone’s loud 106dB dual front speakers and four noise cancelling mics featuring Qualcomm® Fluence PRO™ technology, making push-to-talk (PTT) calls, speakerphone use, music and other audio crystal clear. Three cameras, 13MP rear, 5MP front, and a super wide view 4K action camera – all underwater safe and compatible with action-camera mounts - help ensure you don’t miss a thing, on or off the clock. All three cameras are covered and protected by Sapphire Shield for extra durability.